So, if there is anything that I love more than playing games (and writing about them! ), it’s reading books. I spend a good portion of every day with my Kindle in my hands – whether it’s getting ready for bed, waiting in the car through a soccer practice or whatever. Strangely enough, I no longer log my board game plays, but I still log my books that I read. 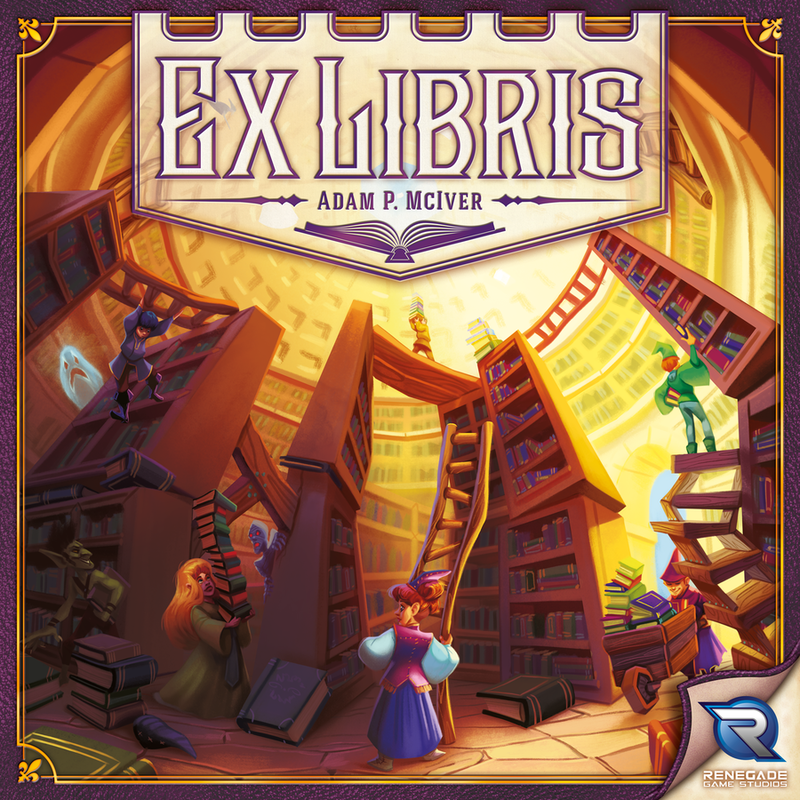 In any event, the theme of Ex Libris, a new release from Renegade Games, definitely appeals to me – in this game, players vie to be the Grand Librarian of their gnomish village. The village itself is represented by arectangular board that also serves as the reminder of the rules and scoring methodology. 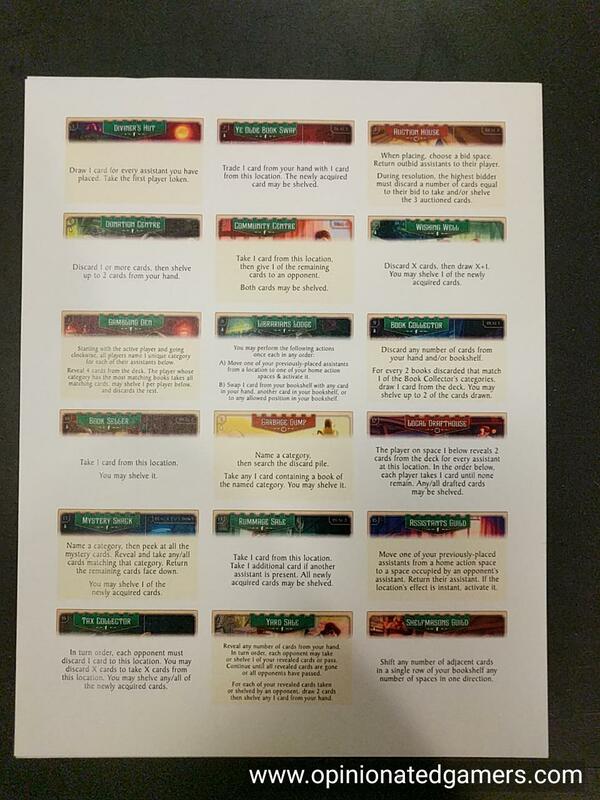 Each player is given their own library – each comes with a unique special action on it – and leaves space on the table in front of himself to build his library. The books are found on book cards, and they will be organized in shelves – though, because you’re a gnome (living in a gnomish village), you can never have a library taller than three cards high. 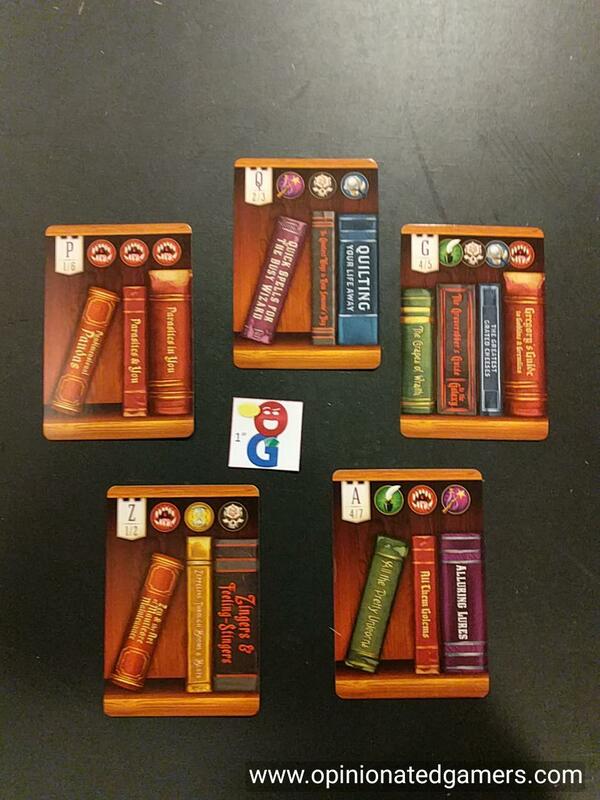 Each player starts with a hand of six book cards. Each player also takes the special assistant that matches their library as well as two general assistants in their player color. There are six different categories of books, and one category is chosen to be the “Prominent Work” for the game and one is chosen to be the “Banned Book”. 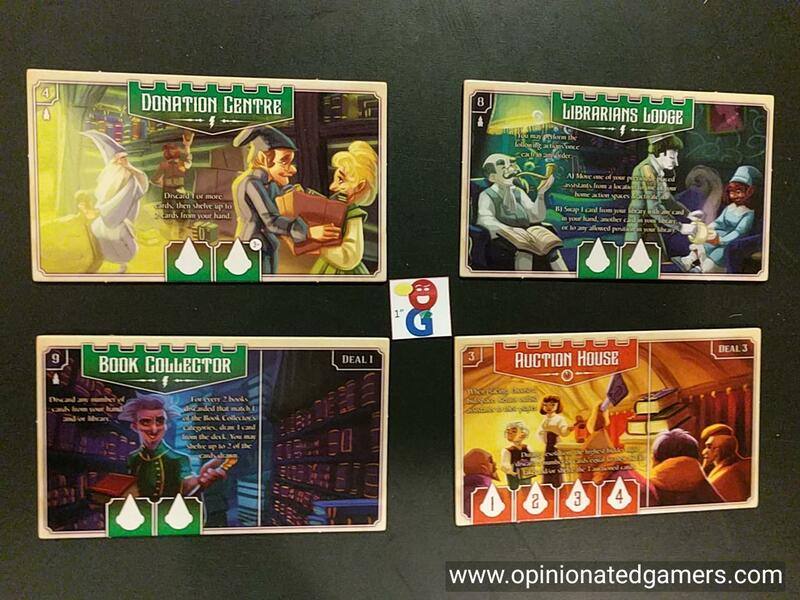 Each player is dealt one of the remaining four types to serve as their secret focus for their own library. Cards are placed on the appropriate spots on the Village board to denote this. There is a deck of location tiles, the Diviner’s Hut is placed under the town board and the rest of the locations are shuffled. The game will be played over a number of rounds – until the endgame trigger is reached (by a player having enough cards in his personal library). In each round, the following 4 phases are always done. 1] Preparation – Deal out location cards until there is one card per player under the board. Many of these cards will have further instructions in the upper left corner, and read these and deal out book cards accordingly. 2] Placement – starting with the current first player, a player plays one of his unplaced assistants on a location tile or on your own library tile. If you place it on your own library, you take one of the home actions printed near the house-shaped icon: generally you can draw a card or shelve a card. When you Shelve a card, you are placing it into your library. The first card can go anywhere, and then every other card must be placed orthogonally adjacent to a previously placed card. Remember that you cannot go higher than 3 cards tall, though you can go as wide as you like. You can also place your assistant on a location tile – so long as there is still an action space available in the lower left corner. If you can do so, you then get the effect of whatever action is printed under the title of the card. Most actions happen immediately (denoted by a lightning bolt). Other actions will happen later (see a clock) in the third phase. If you place your special assistant, you generally get a special action that goes with it. The details of that action are written out on your library tile. It’ll make sense when to take that special action. 3] Resolution Phase – you now go through all of the Locations in numerical order. If the location has a delayed effect on it, that action is now activated in this phase. Discard any cards that remain on the location card at this time. All players take back their assistants as you go through the locations. 4] Cleanup – take the lowest numbered location tile from below the board and place in ON the board – in the “Permanent Locations” area. This card will now be available for the rest of the game. Discard all the other locations from this turn. Then, check to see if the end of the game is triggered – with 4p, this happens when someone has at least 12 cards in the library. If so, go to scoring. If not, start the next round with a Preparation phase. Once the game is over, the first thing that happens is the alphabetical check. Starting with the leftmost card in your top row, you move left to right, going down the rows, making sure that your books are in the right order. The book cards all helpfully come with the letter and indexing information in the upper left corner. Any card which is not in the correct order is flipped over – meaning that you will not score anything for the books on that card. You can voluntarily flip over book cards prior to doing the alphabetical check. Next, you score for shelf stability. You look to your shelves to find the largest single rectangle of book cards – though it must be at least 2×2 in size. You will score one point per card in this rectangle. Then, someone takes the score pad in hand and asks each player to count up the number of books in each of the six types. These numbers are recorded on the score sheet. Prominent works are scored first: 15/9/4 points for most/2nd/3rd in the matching type. 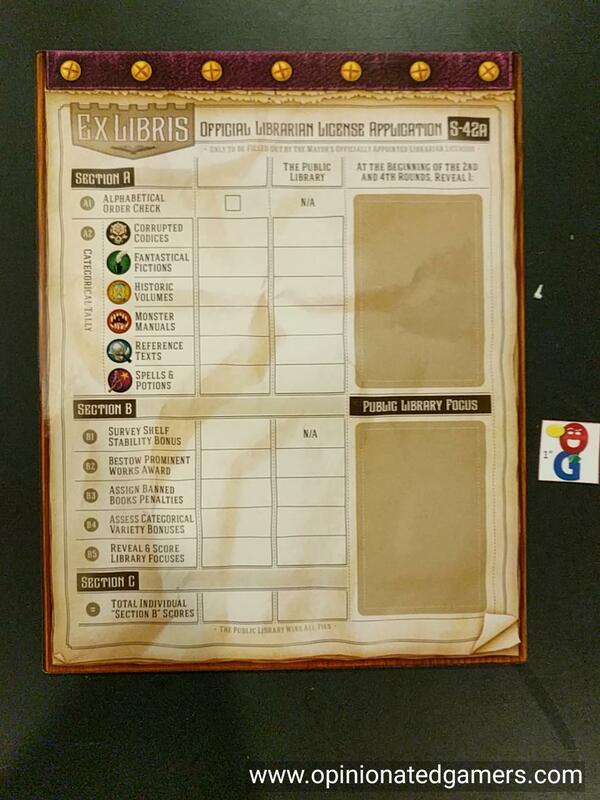 Banned books are then considered, and each player loses 1 point for each Banned Book they have in their library. Categorical variety rewards you for having diversity in your library. You will score 3 points for each book in the category that you have the least of (well, disregarding the Banned Books category). Finally, each player reveals their secret focus and then scores 2 points for each book of that type. The player with the highest score wins. If there is a tie, the player with the fewest cards left in their hand wins. There is also a solitaire version of the game. You will only use cards that have a special solo-game icon on them. In this version, you are competing against an automated public library. There are six locations are available in this form at the start of the game – however, you can only place one of your four assistants on a location tile at any given time. In the cleanup phase, you must discard two current location tiles from the game and then draw a new location tile to the board. Each round, therefore, has one fewer location tile available. At the end of the 5th round, the game ends. In each preparation phase, you also discard a certain number of cards from the book card deck (more cards discarded for each increasing level of difficulty) to go into the public library. 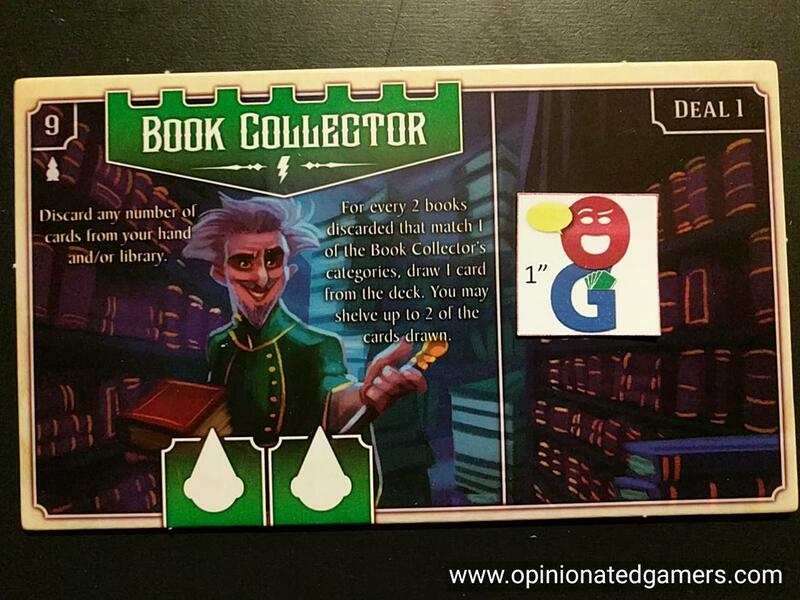 At the end of the solo game, you score your cards as well as those collected by the public library (who owns ALL the cards in the discard pile), and your goal is to beat the score of the public library! So, I was predisposed to liking this game because of the theme. Happily (for me, at least), the game itself held up to my expectations for it. At its core, It’s a pretty simple set collection/worker placement game, but there is a good deal of variety that arises from the timing of the different location tiles. I like the way that this gives you a familiar background to play with but yet gives you different strategies to pursue in each game. The addition of the special assistants (and their different unique abilities) helps add to the game-to-game variety of choices. While placing cards, you have to think about the growing shape of your library – trying to maximize your shelving efficiency score is certainly completely under your control. But, the presence of Banned Books might dissuade you from drawing or shelving a particular card OR your rush to get a Prominent Work or your Secret Focus could cause you to want to play a different card. The first time I played the game, I was surprised by how fast it moved along. I was kind of expecting players to shelve a card or maybe two a turn. Maybe it was the specific locations that we had out – but we had plenty of actions that allowed us to draw and shelve cards, so the game lasted I think only five or six rounds – and this was maybe two turns less than I had expected. In my following games, once I was aware of the fast pace, I changed my shelving strategy a bit – trying to make sure that I was getting cards down in a timely fashion. Of course, this could all be groupthink in our local group, but I’ve heard other gamers talk about this too. The rules look to be long, but in reality, the actual game part is only about 5-6 pages long. There is a fairly extensive glossary of all of the location/special assistant abilities included and then bulks up the rulebook a bit. Overall, it’s laid out pretty nicely, and it’s easy to get a feel for the game after a readthrough. There are a number of loose rules though which were a bit of a concern in our first few play – mostly timing issues and some questions on the special assistant abilities. 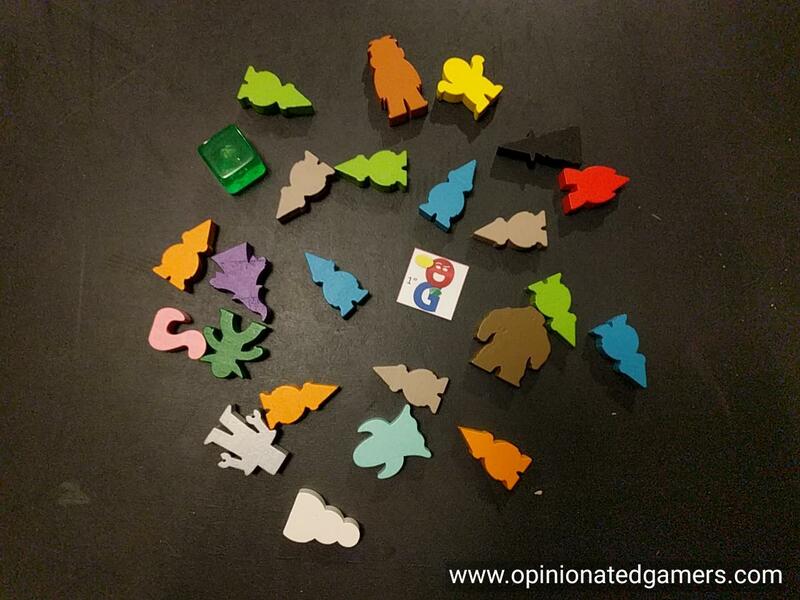 We didn’t have any problem agreeing as a group as to how we would interpret the issue, and they have been mostly cleared up through an “official FAQ” written by the designer and posted in the BGG forums – but that’s still less than ideal. I stumbled across the FAQ almost by accident. 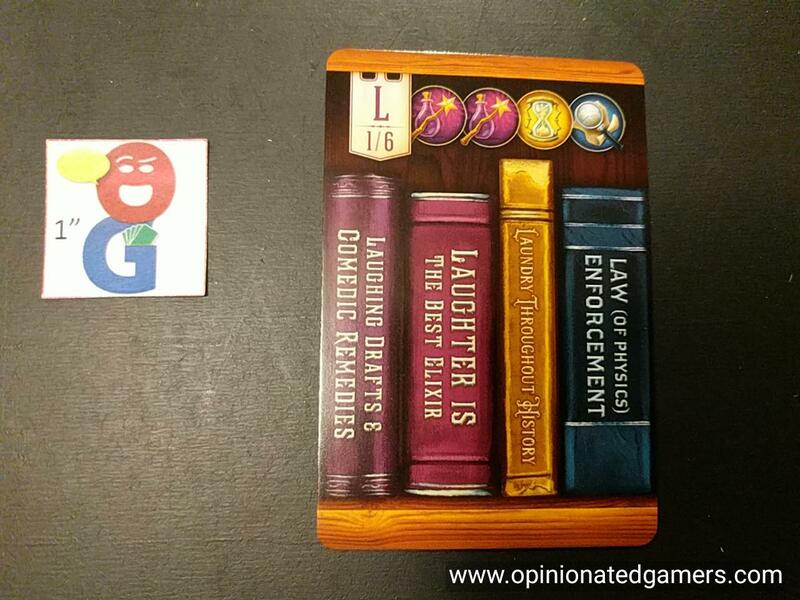 It would have been better for the rules to be tightened up prior to publication because not everyone is aware of BGG or would even go looking for a FAQ. There are also a number of rules which need clarification (timing of things, when/where to discard from, clarifications on shelving/moving books, etc) – most of which can be found online – but again, this is a pain to have to do. It feels like there are a lot of rules which are implied but never actually stated in the rules – and while most of our rulings have been correct because we’ve simply applied common sense to the rules, it’s frustrating to not have it all spelled out in print where it should be in the first place. I really like the art in the game. The artwork is bright and clean, and I love the punny names on the book spines. I believe that each and every book has a title on it, and they’re pretty humorous to read. Each time I play the game, I enjoy reading the titles and trying to work out the joke or figure out what real book the new title was based upon. However, there is one exception to my love of the art; this is on the location tiles. Each location tile has a special ability on it, but it’s printed in such small font and in a non-contrasting color to the background art – it’s pretty much un-readable to me from far away. In this case, I would have liked there to be a plain background area for the action text. The full card are is quite nice to look at, but it takes away from the actual function of the card, and that’s no good as far as I’m concerned. There is a printable location crib sheet on BGG (posted by the designer) – but this is something that shouldn’t have to exist IMHO. It can slow the game down if people have to constantly pick up the cards to read what they do. I haven’t played quite enough yet to really have a definite opinion, but the different library special actions can be unbalanced at times. Some of the actions seem much stronger than the others. But, it may be too early to tell. It’s something that I will keep my eye out for in future plays for sure though. Scoring looks as if it would be convoluted, but if you use the included score sheets and go through the process as outlined in the rules, it’s actually quite simple. The other thing I like about the somewhat opaque scoring system is that it really prevents people from trying to math-out the current scoring situation. For me (and my group), this helps the game move along quicker because it gives you one less thing to have to analyze when you’re deciding what to do. Greg S: I first played the game during the summer (not my copy) and enjoyed it so much that I ordered a copy. I had to wait awhile before it was back in stock, but have since played it again and really enjoy it. I do enjoy the “library” theme, and while I am usually not a fan of the fantasy genre, I think the application works well here. As Dale says, the game has a puzzly feel that I enjoy. Further, it is really not difficult to learn or teach, so it should have a fairly wide audience. Doug G.: Shelley and I played this one, discussing it on Episode 598 of our podcast, hoping it would be as fun as it looked. Dale and I share a love of reading (my second hobby as well), and as an English teacher I wanted to love this one. Heck, shelving books was my first ‘real’ job since I worked a couple of years at Cole’s The Book People in a local mall back in high school. Unfortunately, I was only luke warm on this one, and Shelley didn’t like it at all. The places where you can get your books varied markedly, and people’s particular power could be good, or have little effect depending on the number of players, etc. This one’s on the ‘to be sold’ pile. Alan H: The game was one I was desperate to get at GenCon but it sold out each day before I’d managed to find the end of the queue. I bought it months later. I have tried the game with three different groups and had similar experiences to Doug. The game has some clever ideas but the action text was very hard to read so we had to read it out many times which was annoying. How the font size was allowed to be used is beyond me. The problems I have with the game is that the powers are somewhere between useful and no good; the scoring is not intuitive so you end up focusing on your own special card and avoiding the bad one, but the balance of scoring is uncertain. While there is some pleasure in sorting out your books in the right sequence the game is just not fun. None of my groups are keen to see it hit the table again soon. Sadly. Craig M: Renegade deserves much more criticism for usability issues with the cards. The text as Dale said is practically unreadable which for my group is going to keep the game from getting to the table beyond the first play or two. Neutral.Dale Y, Doug G., Craig M.